↑ "Tsunami Terminology". NOAA. पहुँचतिथी 2010-07-15. ↑ Wells, John C. (1990). Longman pronunciation dictionary. Harlow, England: Longman. प. 736. ISBN 0-582-05383-8. Entry: "tsunami"
↑ "Deep Ocean Tsunami Waves off the Sri Lankan Coast". पहुँचतिथी 3 नवंबर 2016. ↑ Barbara Ferreira (17 अप्रैल 2011). "When icebergs capsize, tsunamis may ensue". नेचर. पहुँचतिथी 27 अप्रैल 2011. ↑ "NASA Finds Japan Tsunami Waves Merged, Doubling Power". पहुँचतिथी 3 November 2016. ↑ Fradin, Judith Bloom and Dennis Brindell (2008). 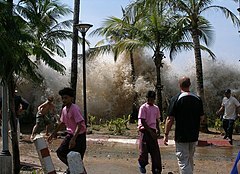 Witness to Disaster: Tsunamis. Witness to Disaster. Washington, D.C.: National Geographic Society. पप. 42, 43.